a third with drink and the rest left empty. 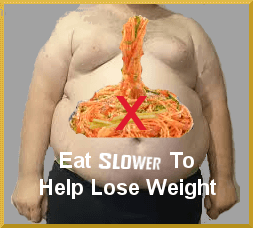 “I’ve heard it’s possible to lose weight by eating slower, is it true?” It certainly is! Not only will it help in your weight loss endeavors but also in improving you health-wise. It’s a well-known fact that slow eaters tend to weigh less than people who eat fast, the reason being that they consume less calories during a meal. This was proved during a study of women who were monitored eating two meals. The first meal consisted of a large plate of pasta and they were instructed to eat quickly. In the second meal, identical to the first, they were instructed to chew each bite at least 20 times. In the first meal, they ate an average of 646 calories in 9 minutes. In the second meal, they ate 579 calories in 29 minutes before they felt full. It’s all to do with your brain. Hunger actually happens in your brain, not your stomach. Your stomach is only the receptacle where the food you eat is processed and digested to provide the nutrients and energy we need on a daily basis. Your brain tells you when you energy and blood sugar levels are dropping, hence the feeling of hunger, normally a feeling of emptiness or rumblings in your stomach. As you eat the stomach starts sending signals to the brain to tell you when it is full. The problem is that it can take up to 20 minutes before your stomach finally sends a signal to your brain that it is full and to stop eating. Eating your food too quickly doesn’t give your stomach enough time to send that final signal, consequently you continue to shovel food into your body and finish up overeating. You’re sat at the table, dinner is served, “boy, that looks good and am I hungry!” You pick up you’re knife and fork and eat with gusto, finishing your meal in five minutes but that final signal hasn’t had time to reach your brain. “Hey, that was good, I think I’ve got room for another helping.” You start to eat, but more slowly this time, unknowingly giving that signal that you are full more time to reach your brain. Unfortunately, by the time that signal has reached your brain you have already overeaten and are now feeling bloated. This may be followed by indigestion and acid reflux, or “heartburn” as it is more commonly known. This is caused through you’re digestive system working overtime and producing excess gastric juices to process the food you didn’t need. Not only have you overeaten but you have also overloaded on calories! As in scenario 1, You’re sat at the table, dinner is served, “boy, that looks good and am I hungry!” You pick up you’re knife and fork and eat steadily, taking time and chewing each mouthful until it’s really masticated before swallowing. You’re stomach is now slowly sending signals to your brain, finally telling it that it is full. You may not have cleared your plate but you sit back feeling satisfied, not bloated and indigestion very unlikely, and, most importantly in any weight loss program, it has helped you to reduce your calorie intake. So, there you have it, eating slower, and, allied to whatever your weight loss program is, it can increase the amount of weight you lose although it is not recommended that you lose more than three pounds weekly. The contents of this page are for information only and not intended to give advice. As always, if you feel you have an eating disorder or problems with your diet, please seek the appropriate professional advice.